Please Note: Currently 8 weeks postpartum. I am woefully behind on these. Bear with me as I catch up! We introduced the bottle and she took to it right away, no hassle. We’re currently using Medela everything — pump, bottles, accessories, bags, etc. We tried placing weight on her chest and not picking her up right away when she cried and with a few trials got her to sleep in her Rock and Play. This was huge as she was getting fussier and fussier and wouldn’t accept being put down. As much as we love newborn cuddles, we were definitely being worn a little thin. Also, putting her down while drowsy is different from putting her down asleep. Mind blown. We still can’t get her to sleep flat, but the supine position of the Rock N Play is working wonders. Oatmeal and beer = milk production (not mixed together of course). And I successfully navigated a day in which I had beer AND coffee and still pumped two bottles. This was the same day #1 happened and I’m pretty sure it was the best day of parenting ever. I got out on my own and successfully had my first nights back at CrossFit Fringe. I also got a haircut that was sorely needed. I think the stylist thought I had just broken free from captivity. Kaitlan had her first non-sponge bath. She had peed while we were changing her so hopefully she won’t scream bloody murder next time. We might also add some accoutrements to make baths more hospitable. I took her out for breakfast with my brother solo and was able to finish almost 50% of my meal. I gobbled the rest in the car on the way home. Kaitlan produced some incredible farts, and enjoyed every one of them. It’s the only time we’ve got an inkling of a laugh and definitely some of her biggest smiles. She’s a Kohler for sure. Focusing on these victories, even if they are little or frankly pretty silly makes all the lack of sleep and hours spent pacing and cluster-feeding a never-satisfied infant worth it. You constantly have to remind yourself that they are trying to figure out their new life just as much as you are, and they have a lot less control and material to work with. We were joking with some visiting friends on Saturday that we’ve found ourselves consistently reassured by the auto-fill in Google. We start typing in our latest issue, and if it auto-completes we know we’re not the only people who have found ourselves stuck. Again, it’s the little things. 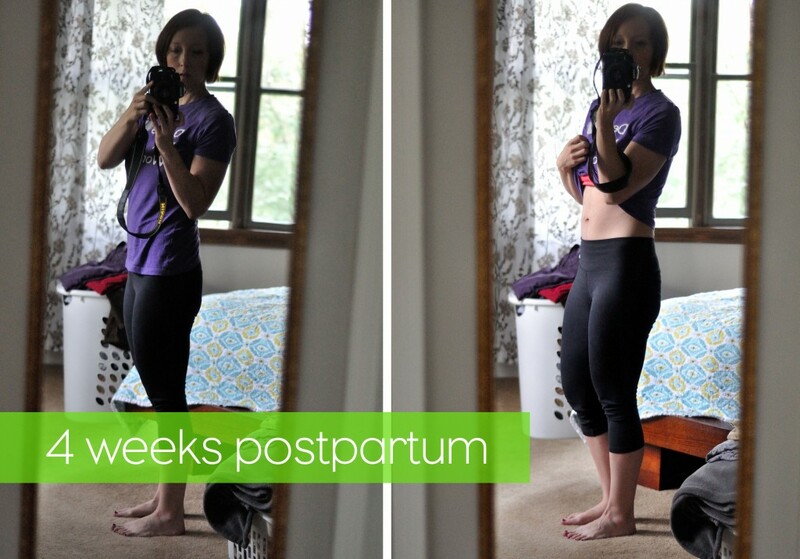 Now, let’s recap four weeks postpartum. Haha, but seriously. 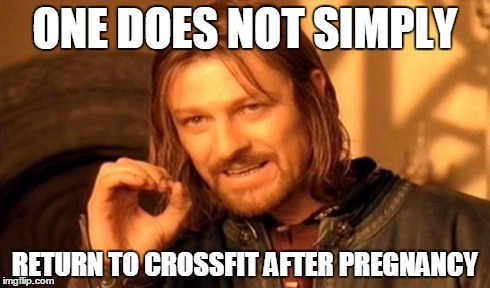 You can’t exclude your midline for 10 months and just jump back into CrossFit, a regime that focuses so heavily on core to extremity and balance. 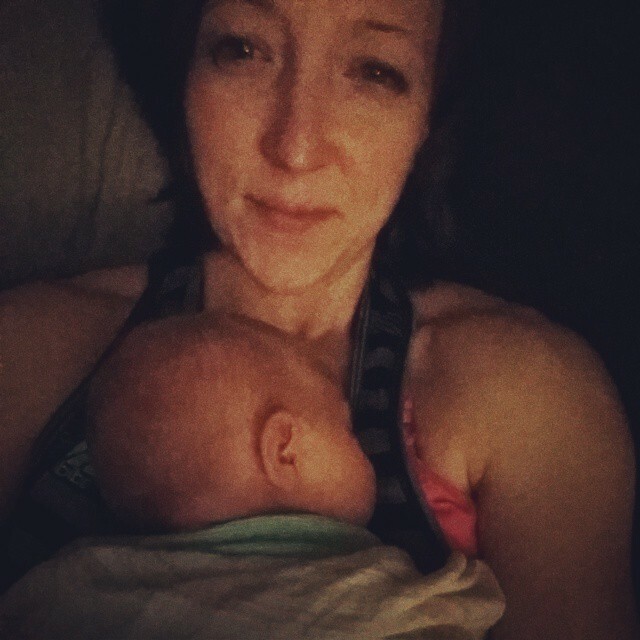 Over the course of my pregnancy, I adapted physical exercise to work around my loss of midline, and in post-pregnancy, my body is still doing that, and I have to essentially untrain and retrain it through mobilization and reactivation. What this has amounted to in my first few sessions is a lot of scapular retraction, bridge and plank work, and some small, short WODs that focus on drawing my midline back together. This is all happening indirectly, and not through direct induction movements like sit-ups, etc. I’m also doing a lot of work at home and have been encouraged to do pilates to my hearts content. 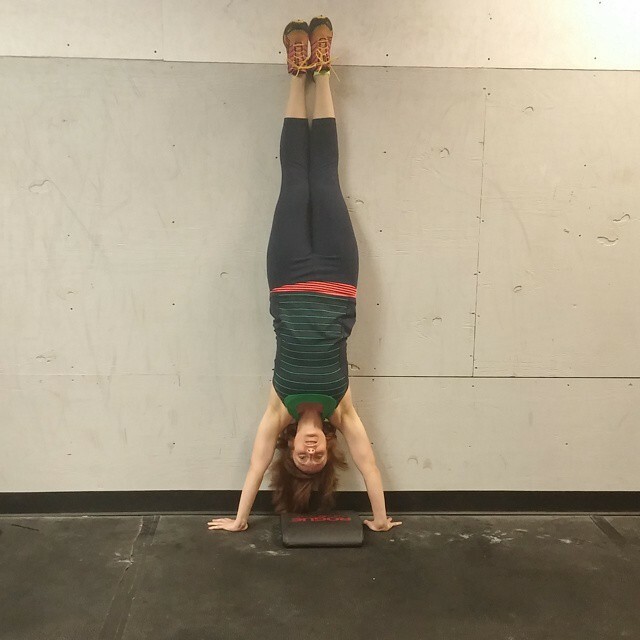 Tackled my first handstand push-ups…felt pretty excited I hadn’t lost them. I’m trying to make serious work of this protocol because I’m eager (so eager) to get back in the saddle of regular training and feeling stronger. For now though, this is doing wonders for my self-esteem. Nutrition-wise I’m still completely all over the place, but I plan to use going back to work as the opportunity to do some work in this area to slowly get back on track. Well, as I don’t really have any weight to lose, there’s really not much to say on this end. I’m still hovering around the 125-127 lb range. Here’s some pics anyhow since I know I take far less selfies than most people, evidenced by my awkwardness and not knowing how to pose myself to look better. You know, it’s kind of a day-by-day thing. I won’t lie. I definitely miss parts of my old life. I cry. I’ve had meltdowns. But then I learn something new about her. I make it to the gym by a certain time. I make a meal for myself. We spend a Saturday on the couch gaming and sharing a beer. Life feels deliciously simpler somehow, and I like it. Not enough to have another kid mind you, I’m set — though I did shed a tear as she sized out of her first outfits this past week. I’m now entering my last week of maternity leave. And it’s both thrilling and daunting. On the one hand, I knew I’d always be the mom who looked forward to going back to work because I need the balance to feel okay. On the other, it feels like it came ridiculously quick and I don’t know if I’m ready — functionally or emotionally. She’s currently eating more than I think I can pump, I haven’t stashed any extra meals like I’d hoped, and she’s still all over the place on eating and sleeping schedules. How this will all unfold I haven’t a clue. I guess this is just another one of those things you approach with no expectations and learn as you go. At the very least, I’m resolved not to beat myself up if we have to supplement with formula or I look like an idiot to our daycare provider. So that’s 3-4 weeks postpartum. I can’t believe we are the parents of a 1 month old already! Here’s to being through with growth spurts for a little bit and teaching our little lady some head control! Question: Have any pilates DVD’s you’d recommend? I LOVE Windsor Pilates. The 3 pack of dvd’s has a beginner, 20 minutes, and an experienced dvd that is 90 min. Love the 20 min video. 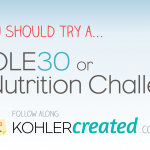 The first time I did the 90 min I cried LOL I have been doing it off and on since high school so I set recommend it! I need to set aside room upstairs to do them. It’s so hard for me to work out at home because I’m tethered to “life” and all the things that being home requires me to do — like clean, tidy, laundry, feed and help out. ‘broken free from captivity’…that’s how I felt when I drove to Walgreens by myself to get the flu shot one day. I listened to NPR and I felt like an adult—a bit of my old self. It was surreal. I think that’s been the only time I’ve been away from the baby since then. 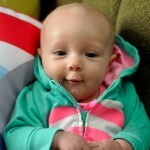 I really love your postpartum write-ups since you are two weeks ahead of me. I had a c-section so my recovery and return to exercise will be different but I got the all clear to ease back into things next week so I’ll be interested to see what you’ve been doing—the pilates included. It’s true! Those first few weeks when they feed so often and you can’t give them a bottle yet, any little outing is like FREEEEEDOM or like…how a night out on the town used to feel. I remember going out to lunch with her and Neil for the first time, and I spent almost an hour getting ready while feeding her. Happy those crazy first weeks seem to be firmly behind us. I can’t recommend any DVDs (though, maybe you might like Barre3 online) I can recommend Samuel Smiths Organic Chocolate Stout. So delicious. You’re doing a great job, friend. I love reading your updates. I’ve had that stout, love it! I’m a huge fan of chocolate, coffee, and oatmeal stouts — even in summer. Don’t care one bit.